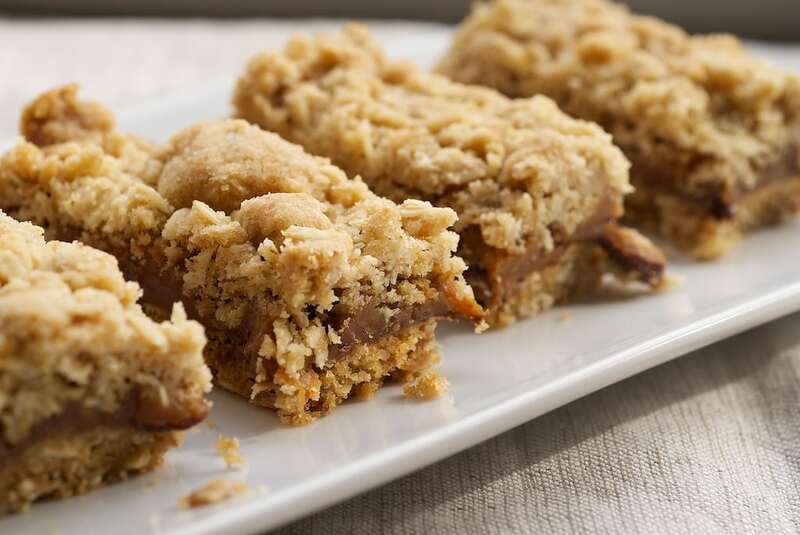 Layered bars are not a new baking sensation. They’ve been around for ages. What I love about them is how easy they are to vary. Change up the crust or the filling or the topping, and you’ve got a new sweet treat suited specifically to your tastes! These particular bars follow a bar layering strategy that is one of my all-time favorites. 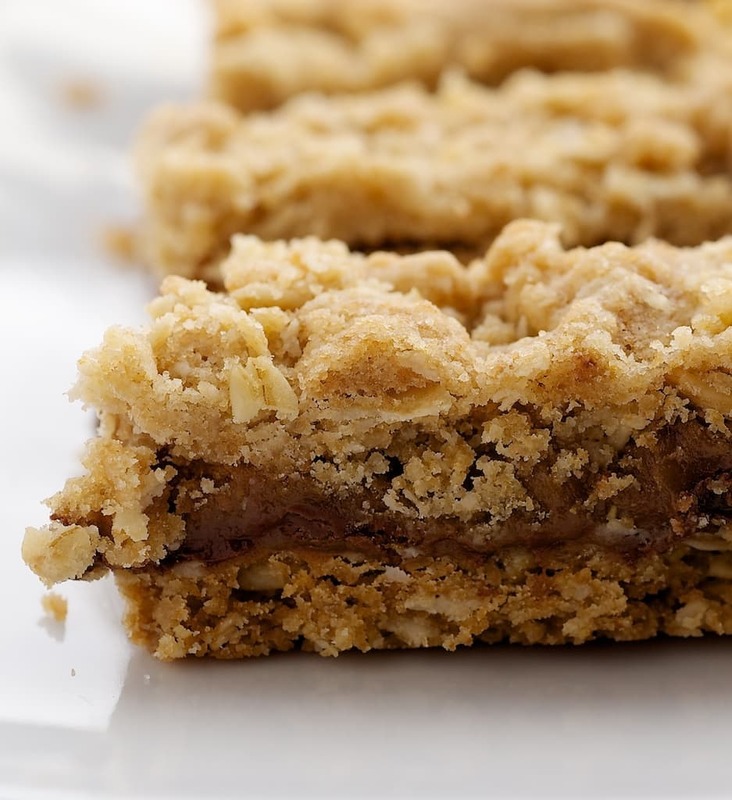 A buttery, oat-y, crumbly bottom and top layer with deliciousness in between. 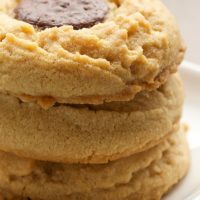 Specifically, these have a creamy caramel layer nestled between all that oat goodness. Plus, there’s just a little bit of chocolate under all that caramel. If you like more chocolate, feel free to toss in a little extra. This is a lovely blend of flavors, as the rich caramel is mellowed a bit by the oat crust. They are still quite rich, so a small bite goes a long way. They are thick and chewy and just about perfect. These are ideal candidates for sharing. Or, maybe they’re too good for sharing. 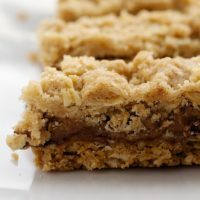 Rich caramel and a buttery oatmeal crust and crumb topping combine in these bars for an irresistible treat. Preheat oven to 350°F. Coat a 9″x 13″x 2″ baking pan with cooking spray. Line with parchment paper, leaving about a 2-inch overhang on the short ends. 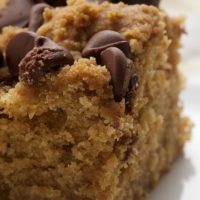 In a large bowl, stir together the oats, flour, brown sugar, baking soda, and salt. Mix in the butter, using a fork or your fingers, until the mixture resembles coarse meal. Press half of the mixture onto the bottom of prepared pan. Bake until just set and starting to brown around the edges (about 20 minutes). Cool in pan on wire rack for 5 minutes. While the crust is baking, cook the caramels and cream in a small saucepan over medium heat. Stir occasionally, until the caramels are melted. Remove from heat and let cool slightly. Sprinkle the partially baked crust with chocolate chips. Drizzle the caramel mixture over the chocolate chips and crust. Top with the remaining crumb mixture. Bake 20-25 minutes, or until pale golden. Cool completely in the pan before cutting into bars. And since I like following technique vs recipes, this is perfect for my sensibility. These look so good! I can’t wait to try my own version soon. 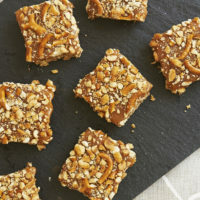 I think these look pretty darn tasty.. although swapping the caramel for something lemon would be my kriptonite. Now these look super delicious. 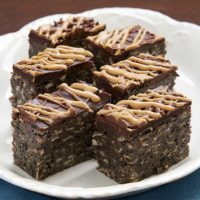 I’m a fan of oats in baking and with chocolate and caramel in too, I’m sold. WOOOOOOW! They look fantastic!!! 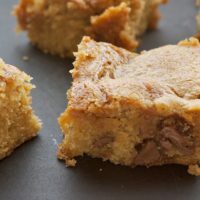 Can you believe that I’ve never baked bars?? This is a great option to start with! This looks great! I love caramel and chocolate together! 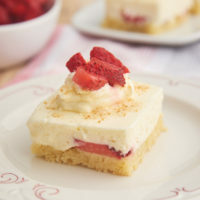 This is something my boyfriend would be a big fan of, so I need to make these soon! These look yummy! How do you store them? Room temp or in fridge? Thanks. They should keep at room temperature for 4-5 days. These are cooling now! Can’t wait to try them! Want to try these this weekend. Did you use cold or room temp butter? Thanks. NRS, I used slightly softened butter. Room temperature butter would melt too much if you mix with your hands. Made these today. We loved them!!! Thanks! Curious, what brand chocolate do you like in these? Guittard chocolate is my favorite I’ve found so far. Oh wow! These look so good. Definitely printing this. These look yummy! Can they be frozen for later use? Hi, Karen. I’ve never frozen these, but I think that you should be able to freeze them. I don’t like wrapped caramels, but buy block caramel at a local cooking specialty store. How much (weight -wise) should I use? You’ll need about 14 ounces.